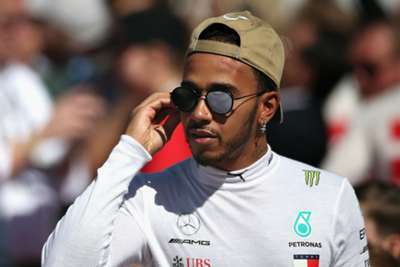 Lewis Hamilton questioned Mercedes' strategy after his early pit stop cost him victory at the United States Grand Prix, with the Formula One title race extended by another week. Defending champion Hamilton had the opportunity to clinch the drivers' championship in Austin, but he was only able to finish in third, one place ahead of rival Sebastian Vettel, and will now have to wait until next week in Mexico to seal his triumph. Vettel had spun out of contention early on Sunday, yet Hamilton's hopes of victory were hampered by the team's decision to pit early, meaning he would have to go in again before the end of the race. Kimi Raikkonen profited to record his first win since 2013 and the Briton was bemused by the call. "I came out and the pit window was very, very close," Hamilton said. "But then after I did my stop, it was 12 seconds - way, way too far to catch up. "I'm not really quite sure how this strategy ended up like that. "It's always difficult, because you only have a certain amount of life with the brand new tyre to make a difference. Once you've caught 12 seconds up, there's none left. "I'm still really happy we got a top three. It's still close. Ferrari picked up their game this weekend. We have to push hard for the next race." And Hamilton admitted he had expected a much better result in Texas. "Big congratulations to Kimi. He did a great job, no mistakes. He had a great start and managed it all the way," he said. "[Second-placed Max] Verstappen did a great job as well. He was on a slightly better tyre than us at the end, so it was naturally a bit of a struggle. "I definitely thought we would be able to do better, but this was the best we were able to do in the end. "It's great that we got to do some racing at least, but we have to keep working, keep pushing for the next race."